Come one! Come all! Get your abc worksheets here! Letter r is the featured letter of the day! Color the letters, circle the letters, trace the letters, write the letters, and identify the objects that begin with r. So much to do. 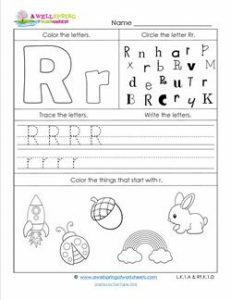 Print your worksheet, make copies and get your kids busy with letter r.
Please go to this page to see all the ABC worksheets in this set.